This news is a bit older, but I wanted to share it with everyone. I had the pleasure of representing TRUFA at the TRU Foundation Award ceremony on Thursday, Nov 29th. You might not know that TRUFA contributes $5,000 each year to student bursaries. This year I got to meet with five fabulous students receiving awards from us. They were so grateful to receive the award and appreciated being able to receive their award directly from me and to have the opportunity to talk about their education so far and their educational plans moving forward. I think our future looks bright given the calibre of these students. 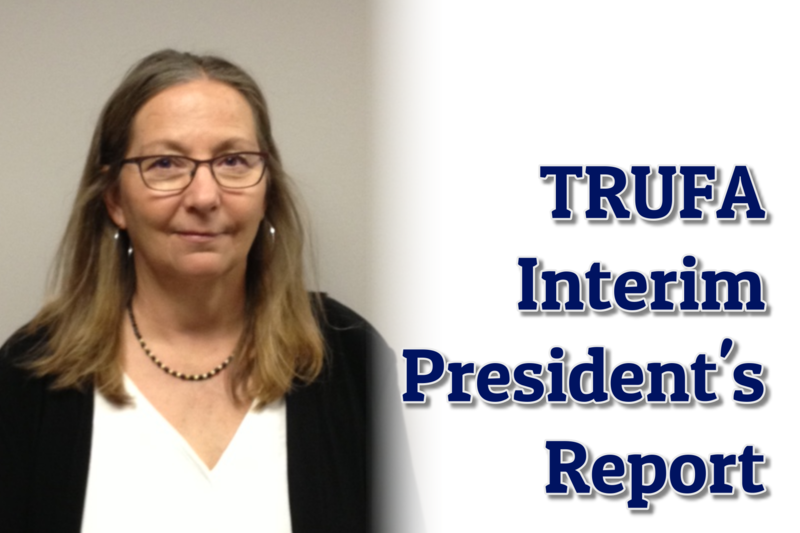 On December 7th, four TRUFA representatives attended an informal meeting with the new TRU President along with CUPE, TRUOLFA, and TRUSU representatives. I was unable to attend but at the December 7th Executive meeting, we heard that it provided a good start to relationship building and also an opportunity for the President to get a beginning understanding of some of the key issues facing our different constituencies. I participated in the following TRUFA meetings that are important venues for dialogue and problem solving about a variety of problems and issues and needed action. * I met with Table Officers weekly in November and during the first half of December 2018, and then weekly since January 3, 2019. We discussed a range of individual faculty and TRUFA-wide issues, keeping up to date on Presidential, Stewards, SWCC, T and P, and Williams Lake items, and then reporting same to the Executive for further dialogue and action. * I attended Executive meetings on November 30th, December 7th, and January 11, 2019 (and chaired two of them). 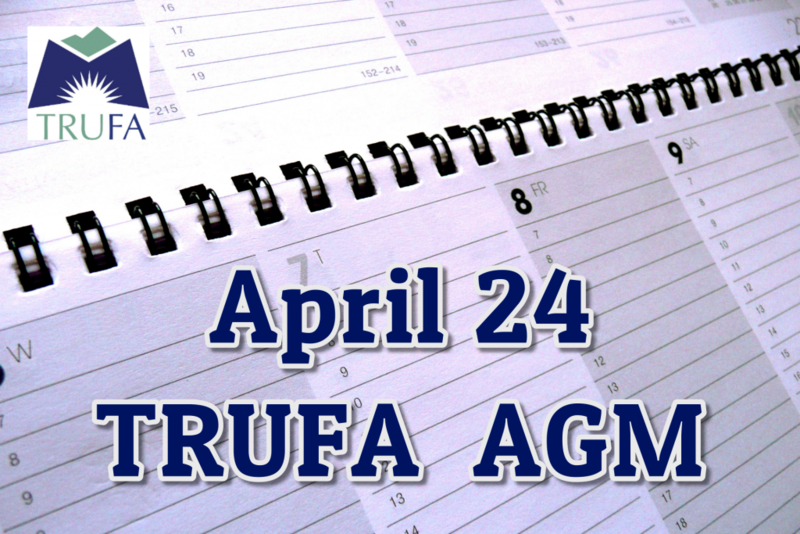 Minutes from these three meetings will be posted on the TRUFA website, once they have all been approved. * I worked with Table Officers to prepare for the next Labour Management Consultative Committee Meeting (TRUFA table officers and TRU senior administrators) scheduled for January 22. I have taken part in approving membership of our bargaining team, and I made small contributions to developing and administering the bargaining survey. I do want to acknowledge the contributions of Michael Mehta and Sandra Vermeulen who provided us with their considerable expertise in survey construction to ensure we had a sound survey design. Lloyd Bennett, VP SWCC and Bargaining Co-Chair, will be providing more detail on the survey results, bargaining team preparation, and next steps as we move into the bargaining process for a new collective agreement. 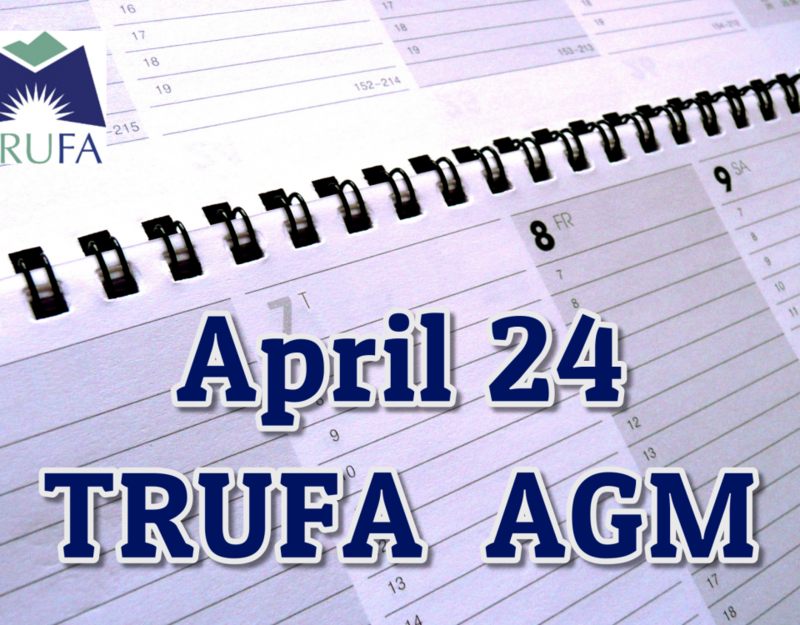 Clear and timely communication between the bargaining team and TRUFA members is critical. Watch for an update on the communication process and protocols that we will be following as we proceed into bargaining. Scheduling the annual December faculty social created a conflict with the National Day of Remembrance and Action on Violence Against Women. As a result, we have rescheduled the social and it will be on Wednesday, March 6, 2019 – a Spring Fling! As always, it will be catered by the Culinary Arts students, and this year, the social will run from 4-7 pm. Watch for further reminders closer to the date. If you have any questions about my report or you want to contact TRUFA for any reason, please let me know. I will attempt to answer your questions and if I cannot, I will direct you to the most appropriate person. 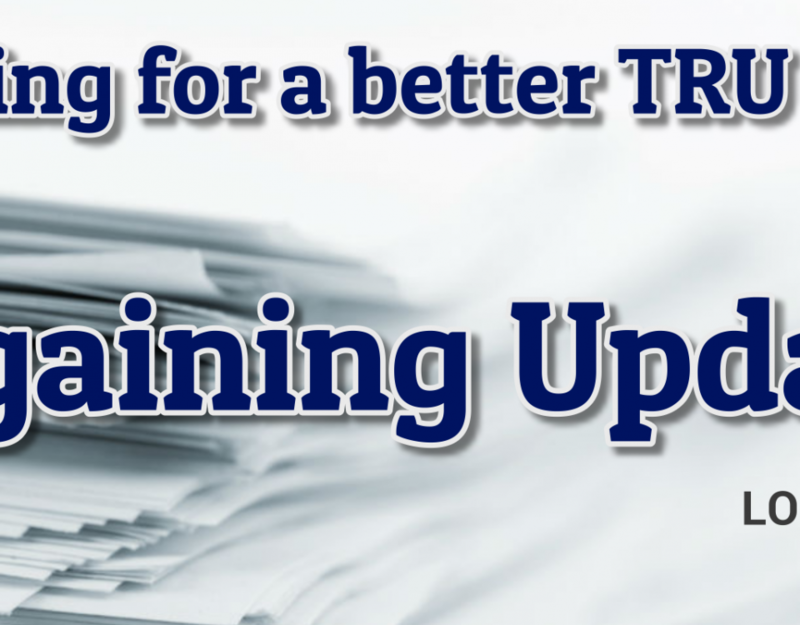 In addition, if you have specific questions about bargaining, PRCs, or stewards work, you can consult the TRUFA Directory to find the relevant VP to call (http://trufa.ca/directory/). 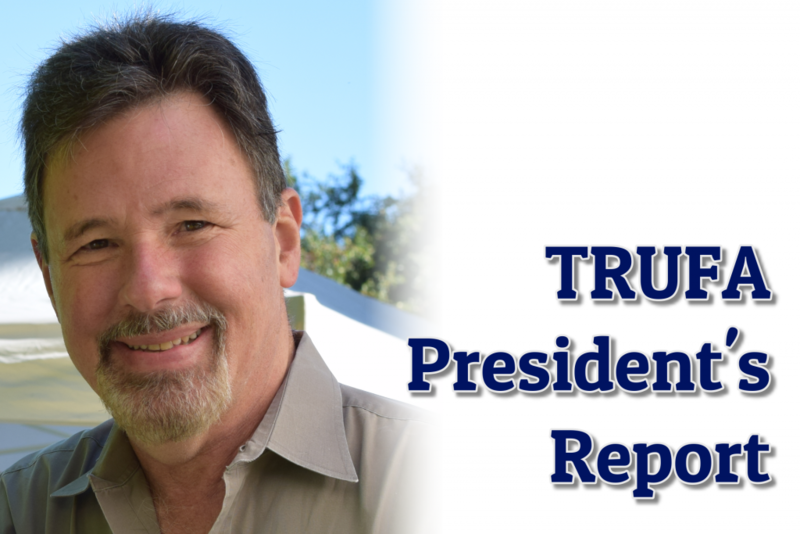 As you may know, I have been in the Interim TRUFA President role while Tom was on bereavement leave following the unexpected death of his wife, Cindy Friedman. This past week Tom has gradually returned to work and similarly, I am now easing back into wearing only one “hat”; that of Vice President. Cindy’s passing has been a very difficult time for Tom and family and I know that it has also been a hard time for many of us. As we move forward with our own healing, however that looks for each person, it is important to be kind to one another and do that little bit extra for someone whenever you can; we can never know what life holds for us and our families and friends.